Boris Godunov was the son of Theodor Gudunov a member of the service gentry. He married Mary Skuratev of Malyuta. They had two children Fedor II and Ksenia (Olga). Boris Godunov was the brother-in-law of the tsar Feodor I. He ran the day to day affairs of the governing the country. Feodor I died childless in 1598 bringing the 700 year old Rurik dynasty to an end. The Zemsky Sobor - national assembly of the service gentry, church officials and commoners proclaimed him tsar. The various boyar factions refused to recognize the decision and never accepted him as the tsar because he could not trace his ancestry to the Rurik family. There was a widespread discontent during the famine of 1601 - 03 and man claimed to be Dmitri (Ivan IV's son who had died in 1591) emerged to claim the throne. This pretender to the throne who came to be known as the first False Dmitriy, gained support in polish army and marched to Moscow gathering followers among the boyars. Boris Godunov died in 1605 before False Dmitriy made it to Moscow. Fedor II, Godunov's son was made the tsar in 1605. False Dmitriy entered Moscow and was crowned tsar in 1605 following the murder of tsar Fedor II. 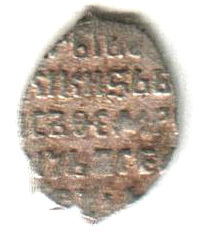 Silver Denga of Boris Godunov. 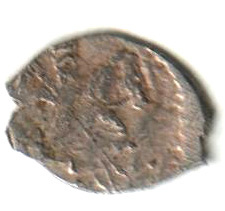 1598 - 1606 CE.